For information about performing point-in-time recovery with NDB Cluster and NDB Cluster Replication, see Section 22.6.9.2, “Point-In-Time Recovery Using NDB Cluster Replication”. NDB API _slave status variables. NDB API counters can provide enhanced monitoring capabilities on NDB Cluster replication slaves. 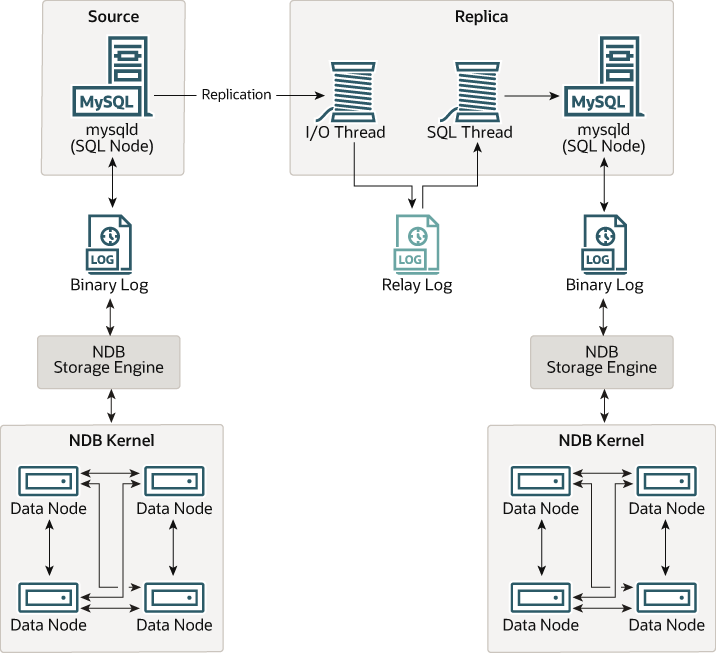 These are implemented as NDB statistics _slave status variables, as seen in the output of SHOW STATUS, or in the results of queries against the SESSION_STATUS or GLOBAL_STATUS table in a mysql client session connected to a MySQL Server that is acting as a slave in NDB Cluster Replication. By comparing the values of these status variables before and after the execution of statements affecting replicated NDB tables, you can observe the corresponding actions taken on the NDB API level by the slave, which can be useful when monitoring or troubleshooting NDB Cluster Replication. Section 22.5.17, “NDB API Statistics Counters and Variables”, provides additional information.